This book will guide you through the concepts of Forensic Mapping as applicable for forensic documentation of crash and crime scenes. It is an indispensable book for new and experienced users in the field of Forensic Mapping of crash scenes or crime scenes. 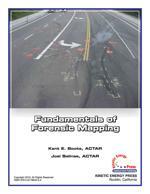 This publication, the first comprehensive text published on the subject of Forensic Mapping, provides a refreshing overview of the topic and a detailed discussion of the ingredients that combine together for effective and successful mapping of complex scenes. © 2012-2019 Kinetic Energy Press. All rights reserved.